Here are answers to some questions you might have. Northwest Ontario's Sunset Country has hundreds of lodges and resorts that vary from rustic to luxurious. There are also many full-service hotels and motels and more than 80 campgrounds for tents and recreation vehicles. In the summertime, the days are generally warm, sometimes hot with slightly cooler temperatures in the evening, but you should be ready for all types of weather. Light clothing is essential for daytime in the summer but for cool evenings bring a sweater and for rainy days a waterproof jacket. Hiking boots along with a comfortable pair of shoes are always a good idea. Don't forget your bathing suit! Radar: Manitoba, Woodlands XWL and Ontario, Dryden XDRon Environment Canada's Green Lane. Forecasts: Armstrong | Atikokan | Dryden | Ear Falls | Fort Frances | Ignace | Kakabeka Falls | Kenora | Ogoki | Red Lake | Sioux Lookout | Sioux Narrows | Thunder Bay |Upsala | Winnipeg. A fair exchange is given for U.S. funds at our banks and border travel centres. There are 24 hour ATM banking machines. Visa and Mastercard are the major credit cards are accepted. Some businesses accept American Express. Discover Cards are not accepted. When bringing pets over three months of age into Canada, you must have a valid rabies vaccination certificate issued by a licensed veterinarian within the previous 36 months. Most lodges and resorts welcome pets, but you should call ahead. U.S. visitors require proof of citizenship: birth certificate, driver's license, or passport. Youths under 18 traveling alone will also need a letter of permission from a parent or legal guardian. If your medical plan does not extend coverage to Canada, you will need extra health coverage. Should you become ill or injured, fully-equipped hospitals are easily accessible in most areas. Sunset Country is policed by the Ontario Provincial Police, and local police forces. Ontario is one of the safest places to visit and live. Canada's gun control laws mean no handguns or fully-automatic weapons are allowed into the country. During the hunting season, if you are 18 years of age or older, you may bring a hunting rifle or shotgun into the province for hunting purposes and up to 200 rounds of ammunition. Primitive weapons such as bows are also accepted if your purpose of visit is hunting. To obtain a hunting license in Ontario, you must bring your current or expired hunting license from your home State or Province. For more information see the Canadian Firearms Centre website. 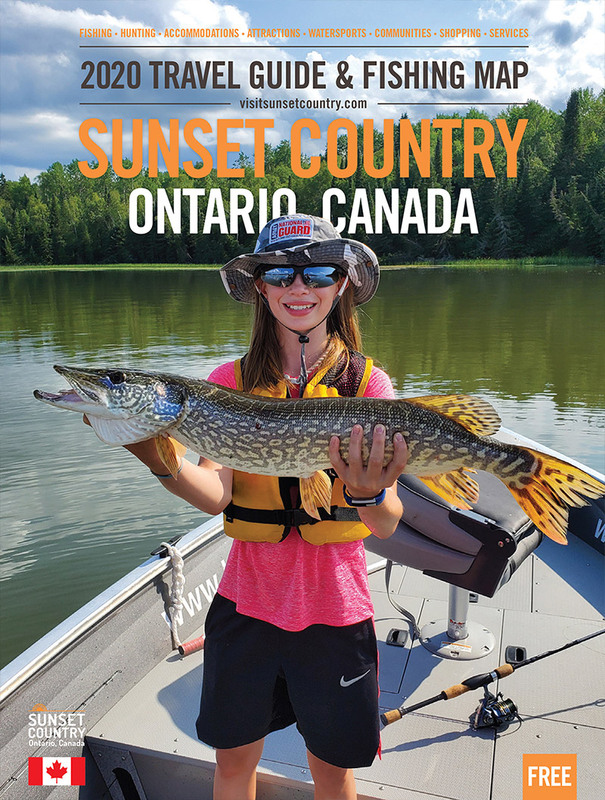 Fishing and hunting licenses are required and can be purchased from most sporting goods stores, resorts, fly-in camp, and from the Ministry of Natural Resources. For more information on seasons, regulations, and license fees call 1-807-468-2501. Hunters: Remember to bring a copy of your license from your home State or Province. Your driver's license is valid in Ontario. Seatbelts are mandatory and speed limits are posted in kilometers. Multi-lane highways:90 - 100 km/h = 55 - 62 mph. Two-lane highways: 80 - 90 km/h = 50 - 55 mph. Urban areas: 40 - 60 km/h = 25-37 mph. For Provincial Park information visit the Ontario Parks website. For Canada Customs regulations you can contact by phone the Fort Frances Border (crossing) at 1-807-274-3655.